Hi there friends. I have been asked so much about all of my kimono looks lately. 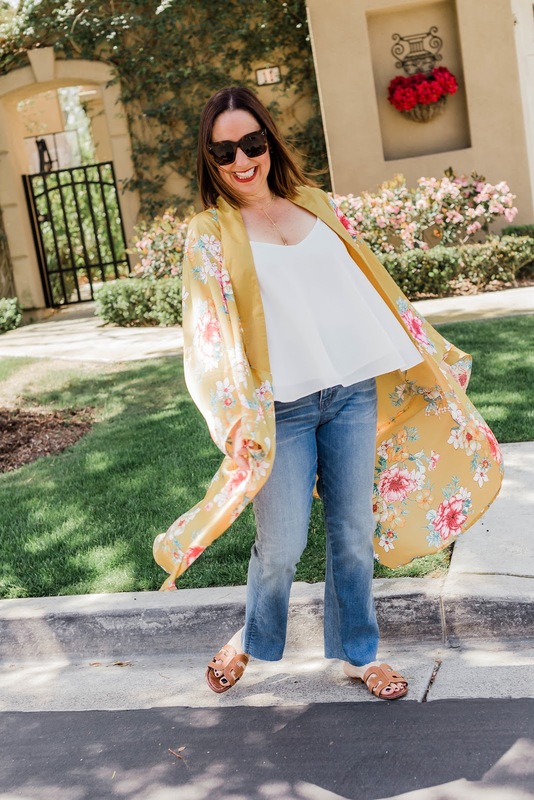 I thought I would share some of my favorite ways you can wear a great kimono today on the blog. I hope you invest in a perfect kimono for the upcoming summer season. One way to wear a kimono is my adding a cute tee and some skinny jeans. This is such an easy look and super flattering!!! You can read about this look in this post. This is such a fun look. This is actually a dress from Vici and I turned it into a fun kimono. I added a casual tee and a cute pair of shorts. This is a perfect casual look. So if you have a dress that you want to style differently, here is a great option. This was what I wore to a Cinco de Mayo party. This Topshop kimono is one of my favorites. Sometimes you need a pop of color and this yellow is so great for spring and summer. You can also wear your kimono with a wider leg pair of jeans, a cute cami and some summer sandals. I love these wide legged jeans from Madewell, and it totally changes the look of styling this kimono. You can read more about this look in this post. This look is on of my favorites. I love finding a statement kimono like this one from Zara and layering it over a slip dress. It can be a much dressier way of styling your kimono. You can read more about this look in this post. I want to hear how you style your kimono. There are so many different ways so have fun with it. You can shop these looks by clicking on the links above. Happy Reading!!!! !